A big part of my healing is focused around energy; reading and feeling the energy around me with others and in the space I am in. “You either drag your energy around with you, affecting and infecting everyone you meet, or you share a cloud of calm and assurance that encourages others to stand a moment and share what you have found. 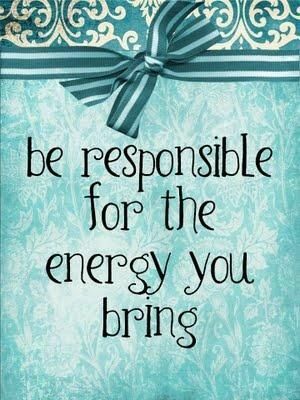 What you bring with you is your choice, your responsibility. It takes practice sometimes but it’s worth it for you and everyone who meets you”. Being a victim of abuse I have learned at a very very young age how to read energy from others and pick up on the energy in the room, and sometimes that can be a blessing, and sometimes it can be a curse. This is something that I work very hard on in therapy. The first question that my therapist will ask me when I come into session is “how does the energy feel”, because depending on how the energy feels, will be the outcome of how the session is – or at least that is how it used to be. In the past month or so, I have learned to trust that no matter what the energy feels like from others, that my own energy is the only one that really matters! if the energy around me doesn’t’ feel very good, or I am not feeling connected to the person I am with, it’s about trusting that no matter what it feels like – nothing has changed about who I am, or who the other person is. This is probably one of the biggest changes I have made in the past couple of months. I am REALLY focusing on not letting anything outside my own energy and my own trust that the energy I feel around me is not mine to hold but my own. This has really made a difference in how I work in therapy and my every day life. It has made a HUGE HUGE difference in my healing as well. I am learning to trust that even if the energy around me doesn’t feel good, its not mine to hold and to really trust my own sense of self and the good energy I bring about myself. I saw this quote this morning above “be responsible for the energy you bring”, that can also mean don’t let others energy bring you down… rise above into your own self and I am still learning that – working with that. Its still a work in progress, but every day it gets a little easier. I am aware of the energy I bring into situations, so I shy away from being around people when I’m down…in order to not ‘bring them down’. However, being alone and isolated is not good for me either. It’s a canundrum (wish I could remember how to spell that). I love what you are sharing here. It sounds like you are learning discernment and detachment – both in the best sense of the words. You are making healthy boundaries. I read all your blogs posts and appreciate what you share. Hi Gel …. thank you for your comment … that means a lot to me.. I am so sorry you are going through tough moments and know I am with you as well..
As you saw today <3 I struggled with just that this morning. An awesome post my friend. A wonderful reminder! Thank you. Joining you from FMF. As a first-time 31 day writer, I struggle as well with those issues of feeling the writing is forced. But from that may come better writing later. I’m thinking of my 31 days as a series of prewrites, quickwrites, to return to and revise and breathe more life into later. Thanks for sharing!